I love pesto but with a nut allergy in the house, I’ve had to forgo it one too many times. The green paste traditionally gets its rich, toasty flavor from roasted pine nuts. Most store-bought versions will have this included in the ingredients and making a homemade pesto without the pine nuts isn’t the same. 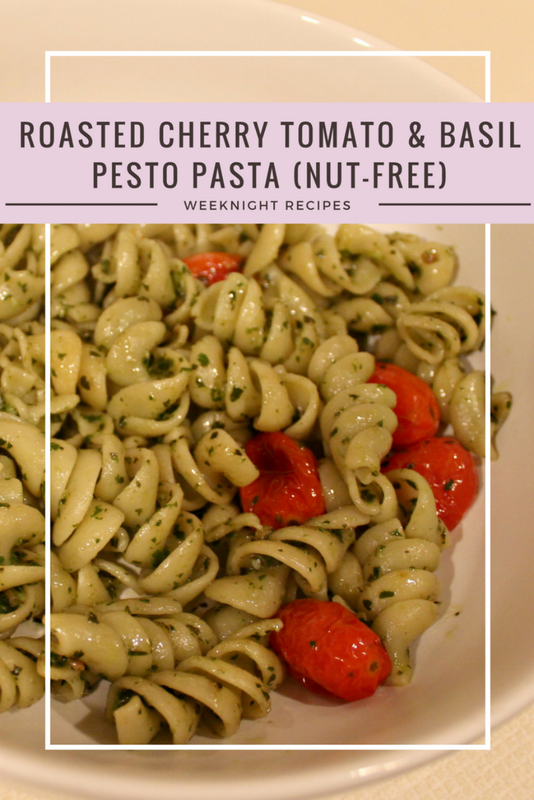 Recently, I’ve discovered a solution and created a nut-free pesto that everyone loves. Well, almost everyone. Did you notice mint in the title? I thought it would make a nice interesting touch to an otherwise traditional pesto recipe. Not for my aunt. She hated the mint. The kids, on the other hand, weren’t too mad about it. I loved it, of course. Like all of my other recipes that I encourage you to customize to your personal tastes, if mint is not something you enjoy in your pasta, simple remove it. You can sub parsley in or add more basil. Whatever floats your boat. Back to this being a nut-free pesto. I had roasted sunflower seeds on hand for another recipe and decided to give them a whirl with pesto ingredients one day. What do you know? It added that toasty flavor that I love about pesto without the nuts! Sunflower seeds have become the anti-nut best friend. With things like Sunbutter on grocery shelves, sunflower seeds replace peanuts and other nuts where those with allergies can’t go. It’s a great alternative and has a similar flavor. Milder and not as nutty as, well...as nuts but close enough to work as a great substitute. The roasted cherry tomatoes add a nice level of flavor to this pasta dish. You could just have the pesto and call it a day. Roasting tomatoes takes almost no effort and lend a beautiful flavor to any dish. They become sweet and release any bitterness. They also add a different texture to the dish which is always a good thing. Try it out and let me know what you think! 1 - Preheat the oven to 375 degrees. Toss the tomatoes with olive oil, salt and pepper. Place on a foil-lined baking sheet and bake 20-25 minutes until bursting. 2 - Bring a pot of water to a boil. Salt the water and add your pasta. Cook until al dente. Drain. 3 - Prep your pesto. To a food processor, add basil, Parmesan, toasted sunflower seeds, garlic and mint. Pulse until ground. Process on low and gradually add the olive oil until a thick paste has formed. Season with salt and pepper to taste. 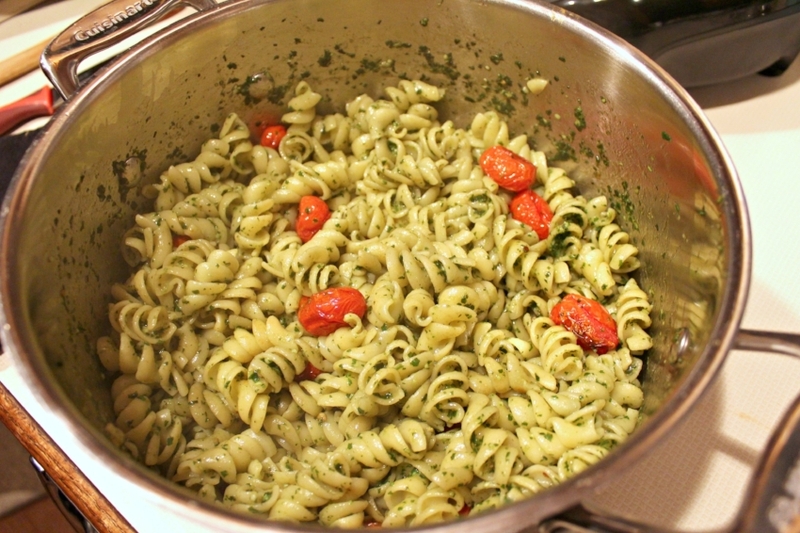 4 - Toss pasta with ½ of the pesto* and the tomatoes. Serve. *Save any leftover pesto for another night or use on sandwiches.